Nothing says spring more than daffodils. 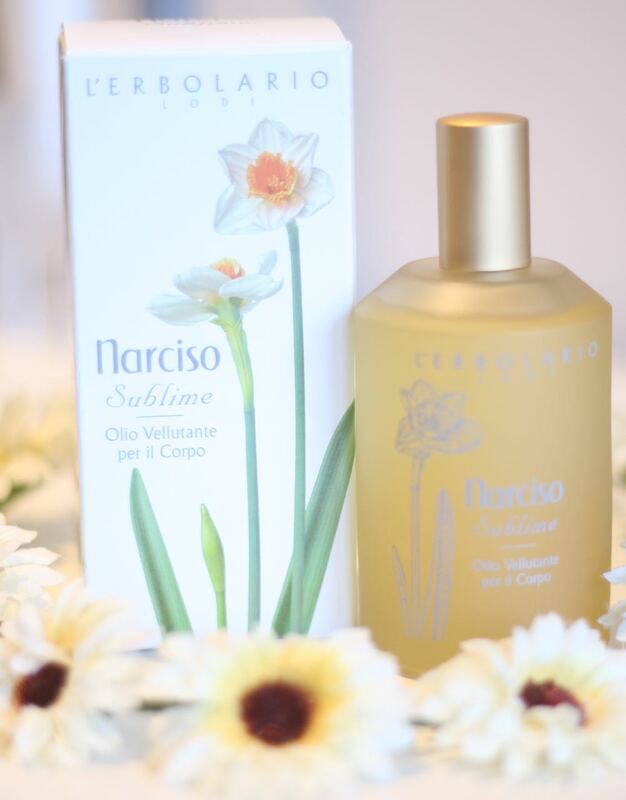 The lovely Narciso Sublime smoothing oil’s fragrance from L’Erbolario takes you immediate to the season, even if it’s still a bit chilly out there. 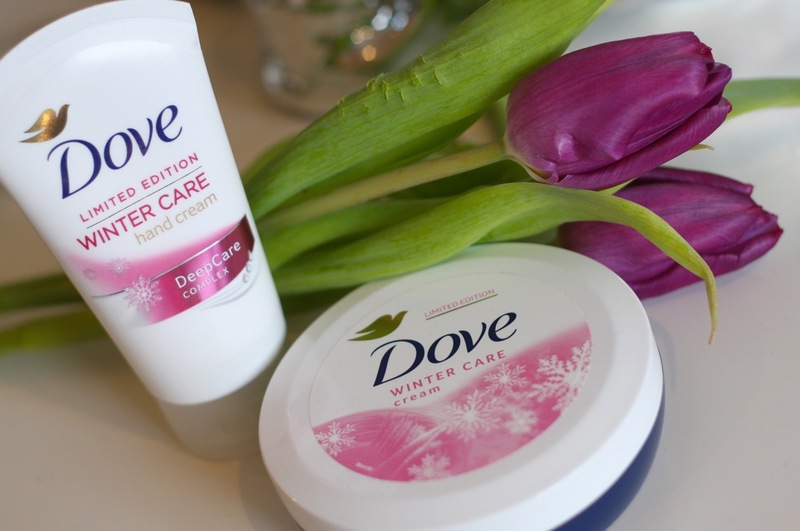 As we all long for warmer days, sometimes is easier to forget that, although brighter, outside is still a quite cold and as the wind bites, the Dove Winter Care collection is still a saviour! Roses… everyone wants to smell of roses, no? 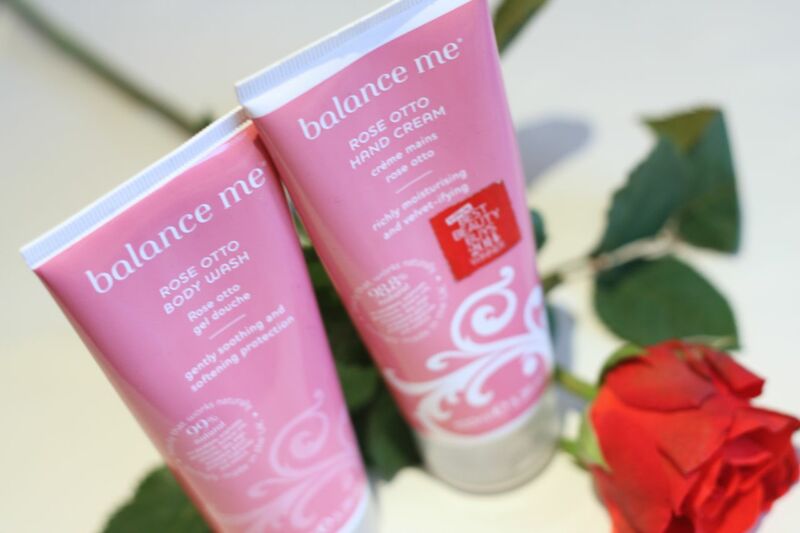 Well, I don’t really mind, especially when it comes in the shape of Balance Me Rose Otto Hand Cream and Body Wash.
Imperial Leather raises the luxury bar at shower time with their FoamBurst Luxurious Body Wash. 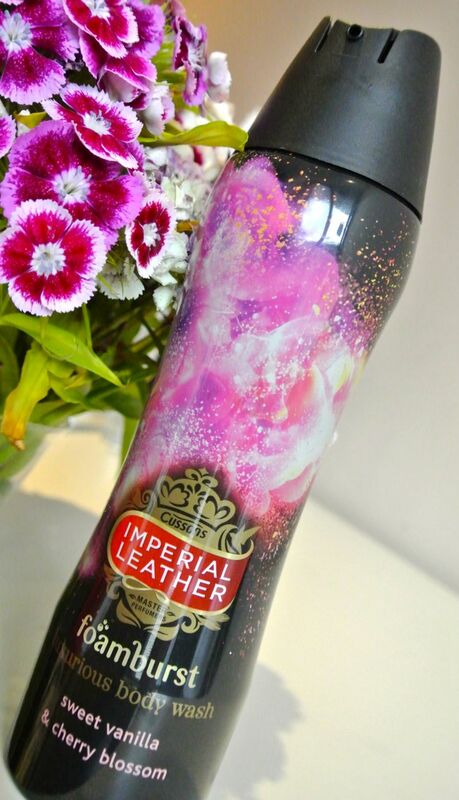 Seriously, I felt like I was showering in pieces of sweets scented clouds when using the Sweet Vanilla & Cherry Blossom one. That time of the year you cannot bear hiding your legs anymore, but they are so pale that it should be illegal you flash them in public. I know too well. We all know we will only be able to tan naturally in a few months. So fake it. And this time, I am using Lauren’s Way Darker than Dark Glam tan. I am pretty sure most of us know the classic St Ives apricot scrubs, after all, it is said to be the number 1 scrub brand in the UK! Part of the Timeless Skin range, the St Ives Renew and Firm apricot scrub has been in my bathroom for a few weeks now and I am getting at least one, but usually two good scrubs a week with it – especially before my weekly fake tan session. This scrub contains apricot – which is full of vitamin A type goods and antioxidants and corn kernel meal and walnuts as super 100% natural exfoliators. Also has gentle alphahydroxy, it is non-comedogenic with 100% natural extracts and without parabens, phthalates or animal-derived ingredients. It has been used as a body scrub and provides soft exfoliation; the granules are firm and well distributed in the cream; you noticed the two textures of exfoliators . It is not super dense with granules and feel very gentle on the skin. when washed away the skin feels soft and quite moisturised. The smell is very subtle and pleasant; the scrub goes quite a long way too! I am not quite sure about firming, as I am using all over the body and it would probably take some time to see this type of effect, but my skin feels renewed for sure!!! By browsing their site, I also found out that they have not only scrubs, but a very extensive range with different care for various skin concerns! 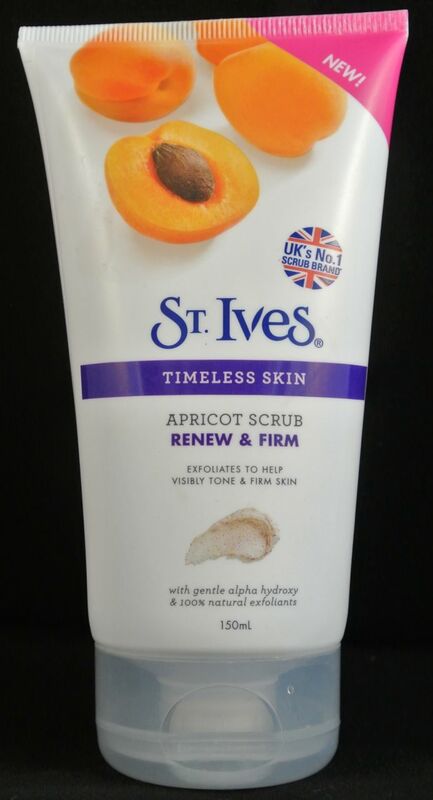 Worth checking out the St Ives site for the Renew & Firm apricot scrub, usually priced under £5 and 0ther products. This post contains PR samples. This review, however, is based on my own true experience with the products and reflects my honest opinion on them. 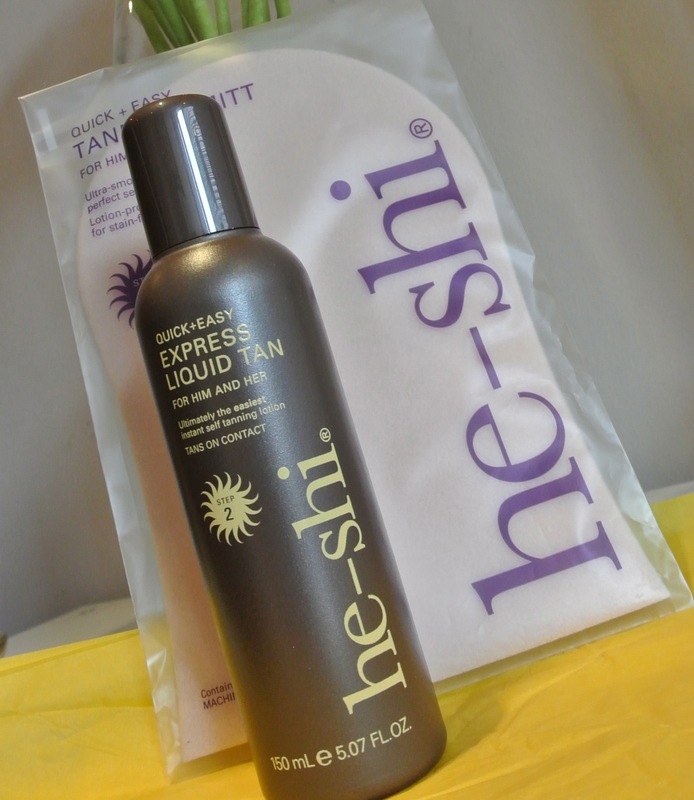 First I tried the liquid tan from He-Shi and loved it. Thought I couldn’t really find another product that I would like as much… until I tried their dark foaming mousse. When you pump it, the dark supple foam comes out. Application is great, the foam glides on the skin, the fact it is dark makes it easy to see where you applied and it fries very quickly. Immediately, you can see a darker tone, but this will develop over eight hours leaving you with a great glow. 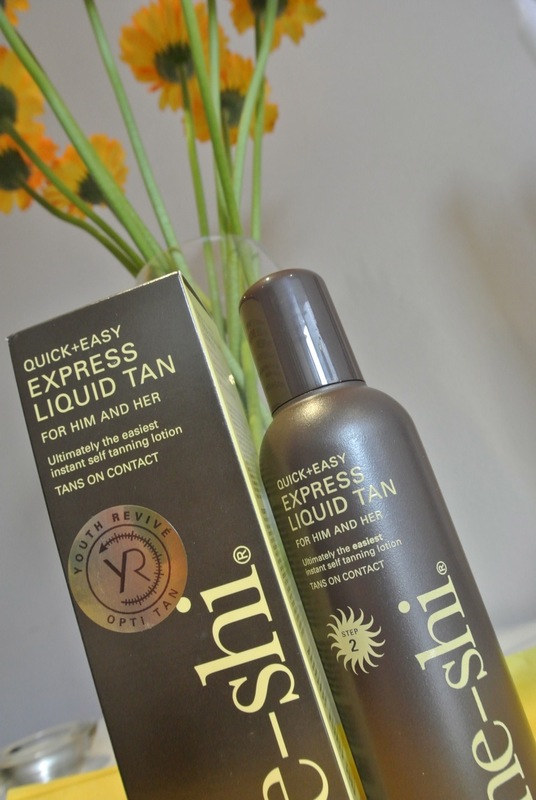 It works the same way as the Express Liquid Tan I reviewed before, but I think I prefer the foam type! The lovely colour last for about five days too, it is pretty much smell free and doesn’t transfer! I am really in love with the He-Shi products – although I am admittedly laying off them for the moment as I have a great natural tan, fruits of my France holiday. But I will be hanging on to it, topping it up with He-Shi! Sunbathing. I was very close to forgetting what it feels like to look at my body and have that golden glow. I welcomed that tan-mail and thanks to He-Shi, I didn’t forget. In fact, I developed a noticeable yet natural tan really easily. The first thing that surprised my was the liquid consistency on the He-Shi Express Liquid Tan (I know, the clue is in the name!). It is like caramel water. Their tanning mitt is a great tool to the perfect tan. 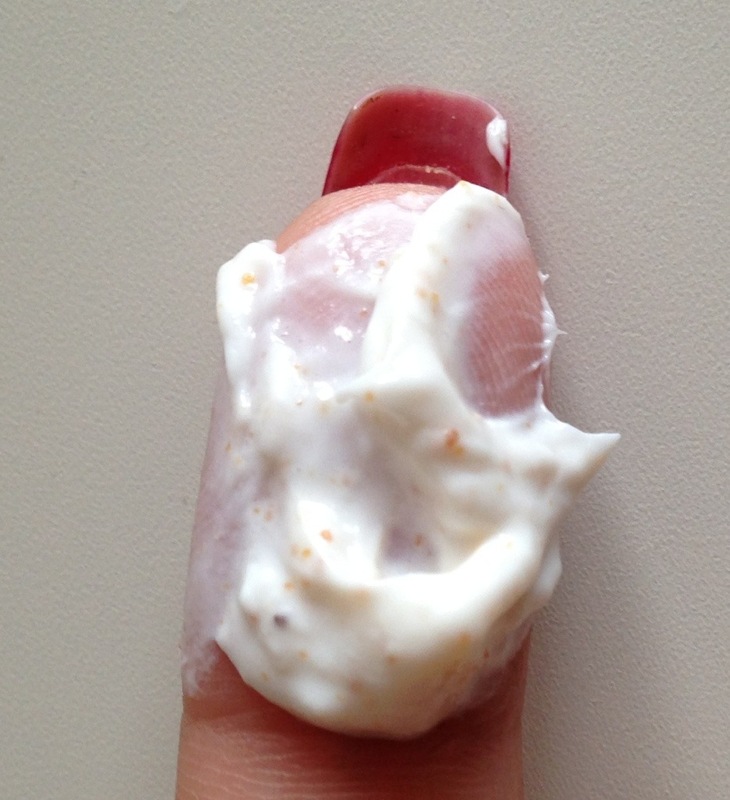 Using that, I was able to quickly apply the solution on my whole body, without worrying about orange palms. The fact the liquid is dark serves as a guide so you won’t apply twice on the same place, and help you make sure it is well spread and avoid streaks. Application was very easy, the liquid glides on the skin, a small amount goes a long way and it can be layered to build up colour. 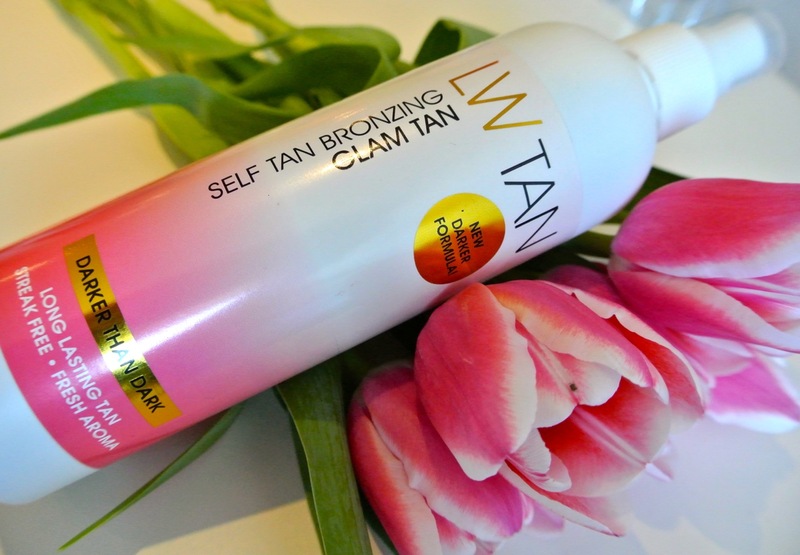 Packaging is very simple, the bottle easy to use during the tanning process. Now, I noticed a change in colour immediately, as the liquid is dark, but it really developed overnight into a golden tone which lasted a good 5 days – I didn’t apply too much, spreading it really well. It smells a tiny bit (only if you stick your nose on your skin and smell it, but I didn’t catch a single whiff of the biscuity smell during the day/night). What I also like is that, besides it being a great product, this is not tested on animals, contains moisturising agent, is Ecocert certificated (it means it is organic and natural – 100% natural DHA) and paraben and alcohol free! Nice, eh? Thumbs up and definitely recommended. So London, you might give me grey skies, but you shall not take away my tan! Flávia starts my lipocavitation – with a smile! I love a good body treatment but I usually have face ones more often. When I was invited by Flávia Azevedo at Body Wise Clinic to sample one of theirs I was chuffed – it seemed she read my mind, as I have been retaining a lot of liquid, and feeling a bit puffed up after changing medication. The clinic is located in one of the business units above shops on the Queensway, a super central and easily accessible location. The petite clinic, pretty much the treatment room itself, is very clean and comfortable and the calming ambiance felt miles away from the bustle of the main road. Flávia suggested the lipocavitation, a treatment known as the “non-invasive liposuction”. The machine has metallic pads like an ultrasound one, and it works pretty much the same way: by emitting strong sound waves that reaches the fat layer, breaking down the fatty structures into a something that our bodies can absorb and use as energy. Nice eh? There are a few contra-indications to this treatment; those suffering from fatty liver disease, some types of cancer, decompensated diabetes, high blood fat, renal insuffiency or women wearing copper IUD (for stomach treatments) should not do it, so Flávia asks about all these conditions beforehand. She recommends that you follow some rules to maximise the treatment, such as not eating for an hour before and after the treatment, avoid alcohol during the treatment, especially 24 hours after (as the fat is processed by the liver) and not to wash the area at least for an hour after treatment, so the products can keep working. My measurements, before and after! She first asked what area concerned me the most in my body. After marking the region to be treated, I stepped onto the treatment bed for a real treat. She applied a warming product to the marked area, then a gel (similar to ultrasound gel). There is a discreet noise and you feel a tiny bit of vibration while she works the area. This goes on for 5 minutes on each treated area. After that, she applied radio-frequency for 10 minutes, which heats up the skin’s deeper layers, aiding tightening. After the treatment, the area feels quite warm and the skin goes slightly red and a tiny bit itchy from the all the stimulation, but it is nothing uncomfortable. Flávia will recommend a tailored treatment to suit your needs, depending on how much and where you want to see reduction. Usually, a couple sessions a week are recommended, as well as a minimum of 48 hours between sessions, for better results. The typical measurement reduction is of about 0.5 to 1 cm per session; legs and waist areas usually show better results, with loss in arms being less. After that, I had a great lymphatic drainage massage. This is no ordinary massage – it is a gentle, rhythmic massage to push the toxins and fat broken down by the previous procedure towards the lymph-nodes and subsequently into the blood stream, to be eliminated by the body. It is very good for circulation and those suffering from “heavy legs”; it also helps diminish the appearance of cellulite. Following that, an “aesthetical massage”, which works at a fat level and not muscle. It is worth remembering that this massage does not eliminate fat, but helps to smooth the skin appearance and shape the body by helping to eliminate liquids retention. I really like that Flávia explained the procedures and what I would feel in detail, so there were no surprises. She told me about the main benefits, touched on secondary benefits but she didn’t create false expectations; many times she mentioned that measuring takes place before the course of treatments, in the middle and at the end, not after very session not to create anxiety. I asked her to measure me… and the reduction was, amazingly, more than 2 cm from one of the measured areas (and about 1 in others)!!!! At the moment, there is a promotion until the end of May; six 30 minute lipocavitation sessions for £120. The normal price per session is £40. For the all over the body (not face) lymphatic drainage massage, a single 50 minute sessions costs £40, but packages are available, at £175 for five sessions. BodyWise Clinic is located at 54 Queensway, London, phone number 078 6831 9584 . You can get more information about the range treatments and the team on their website. You can also buy their treatments at Wahanda. Ooooh, I absolutely LOVE a body oil, it keeps my skin soft in London’s crazy weather and hard water so I consider myself lucky to have received this GORGEOUS body oil from Elemis to keep my skin happy! I have been using a few Elemis face products lately and my skin, which has been going through an awful patch, has been liking them. I also had an amazing facial and massage at their London Spa – bliss – so I have lots of good things to say about the brand. To me, one word defines this Frangipani Monoi body oil: luxurious. It is made with Tahitian monoi (Monoï oil is an infused perfume-oil made from soaking the petals of Tahitian gardenias (best known as Tiaré flowers) in a semi-wax coconut oil) and infused with frangipani flowers (you know, those super fragrant tropical flowers with big oval petals that are white on the outer border and yellow-pinkish on the inside, that girls put on their hairs?). It has this thing of being solid when cold, and you need to put the bottle into warm water for it to melt. I fill a container with water at the beginning of my shower and by the time I am finished, it is liquid, ready to be used. If I have to point out a downfall, a very small one, is the top of the bottle. Looks very pretty, a little metal drop, but can be a bit fiddly in the shower – could easily go down the drain and because it is so dinky, it’s a bit tricky to manipulate with oily hands. But this wouldn’t stop me from buying it. The consistency is great and it gets absorbed quickly by the skin. There is no greasy feeling after application. A small amount goes a reasonable way. The smell is lovely – flowery, not too sweet, and not overpowering either. It lingers in the body afterwards but doesn’t interfere with your perfume, for example. My skin felt soft and hydrated afterwards. Really, I will repeat – a luxurious product, try if you can. It is a 3 in 1 product so it can also be used in the hair and nails (which I have). What is not to love? You can buy it here, full size retails at £31.50, Elemis also has travel sizes and other products in the range made with the same ingredients. This post contains PR samples, however, this review is based on my own true experience with the products and reflects my honest opinion on them.